Tell me a bit about the beginning of Capricious. Who did you start it with? Why the name Capricious? I got the idea for Capricious in 2003, when I was about to finish school at NYU. Shortly after, I moved to Amsterdam to be with my girlfriend, and slowly got Capricious going there, with her support and many other great people. To create a platform for emerging artists from all over the world. How do you choose the format: very little text, large images, perforated pages? I think there is so many magazines/journals out there that represent either text around photography, or journalism, or fashion photography. Capricious is a magazine that gives the image full space and rest. The perforated pages play with the idea that the images in the magazine are also individual pieces of art. 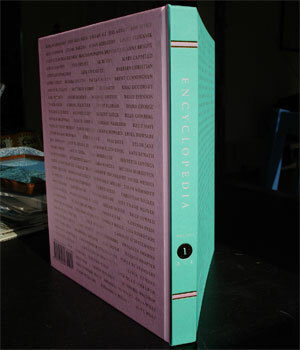 Tell me about the origin of the idea for encyclopedia. Where did you start? It all started in 2004 when Tisa Bryant, Miranda Mellis, and I were in the MFA Graduate Program in Literary Arts at Brown. We were inspired to create a new kind of fiction-oriented publication by Gail Scott, a fabulous Canadian woman who was a visiting writer in our program. We knew that we didn't want to start yet another journal/lit mag (nothing against 'em--we've all worked in the realm, we read them, we publish in them) and we knew that we wanted the form and structure of the publication to relate to/inform/engage with the content. We wanted to include all kinds of fictions and narratives, and visual art as well. After a few meetings and a lot of wine, Miranda started talking about the old encyclopedia—and that was that. We got excited by the encyclopedia as an organizing principle, and we were interested in the way the encyclopedia sought to contain all knowledge—we knew immediately that it was a model we wanted to tweak/subvert/play with. We started in Providence, but now we're in New York and the Bay Area. 'Encyclopedia' means "circles of knowledge" and that is a guiding principle for the work and artists that we publish: we want to expand and break open existing circles of knowledge, to allow overlap and back-and-forth and cross-referencing and unexpectedness. I ask this first, even though it's a bit obvious. What is your mission? North Drive Press first came about and continues to exist in order to create an archived space for emerging artists via interviews and texts, as well as through the production support of art editions. The majority of our contributors are not at the point where they are producing texts or multiples for well-known publications and publishers. We want to provide a space of distribution via NDP's annual issues and our website. The project is seen as a forum, archive, and project for artists and by artists. I always want to know what past ideas/projects/plans bring people to what they're doing now and the process they went through to get there. What were you working on before that brought you to this project? We are both lovers of ephemera. Matt started the project originally to produce something like a mobile/collectible group exhibition and to foster professional and social relationships between artists. When Sara was asked to join as co-editor, it was because they both had an affinity for artist books, democratic distribution, and loosely organized presentations of materials by artists. We are both artists and our individual practices inform our collaborations and vice versa. 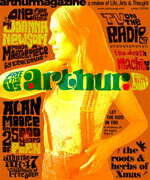 Arthur Magazine is a free bimonthly news/music/culture magazine that shows up all over the country in record shops, cool bookstores and coffeehouses. Unapologetically anti-war, nerdy and a bit hippy—Arthur eschews the irritating faux-irony and snarkiness of most American lifestyle/culture magazines. We got all frightened because Arthur looked DOOMED—but this summer it is back! How did you come up with the name Arthur? Around the time that the project needed a name, sometime in 2002, I was baking bread and the flour I was using was King Arthur. What is Arthur's editorial mission? What made you put in so much effort to produce an independent national magazine? Arthur's editorial mission, at least at its inception, was to give writers the freedom to write about what they wanted, in the way that they wanted to, at the time that they wanted, and at the length they wanted, in a magazine that would reach an audience they wanted to reach. Of course, it's a bit more complicated than that. We don't accept the work of just any writers, and we have to balance subject matter in each issue so that the magazine will offer a compelling mix. In practice that means articles sometimes get commissioned and then held for publication. In some cases, writers have waited for up to a year to see their piece in print. Our guiding principle has been 'writer knows best.' When writers ask me for advice on how to approach a piece that they are working on for Arthur, I often tell them to do what the piece requires. Serve the piece. Serve the audience. If it demands 12,000 words, with first-person narration, so be it. So, the writer, now freed, shoulders a responsibility that's been usurped by house editors in American publishing in the last 30 years. The result, hopefully, is more engaged writing that cuts closer. Remove the rules; ratchet up the responsibility; see what happens. Same goes for photo essayists, cartoonists and columnists: they all, pretty much, have carte blanche. And they deserve it. These people are very, very smart. The readers deserve it, too, of course. What we're going for is highest common denominator; nothing gets dumbed down at Arthur, but at the same time, everyone is aware of their responsibility to communicate, not simply self-express. Constance is a limited edition art magazine out of New Orleans that premiered in the aftermath of Katrina. New Orleans, in my opinion, is an undervalued center for the arts, so I was very excited to see this extremely well put together full color magazine that showcases artists and writers living and working in my favorite city. 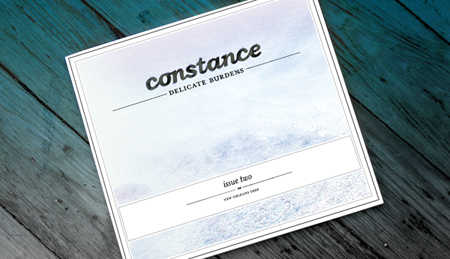 The second issue of Constance, Delicate Burdens is out now. Why the name "Constance" and What is Constance's editorial mission? Cord Bueker, JNR and I lived on Constance Street before the storm. We lived on a great block. Our year there was very important for my personal and work development. It was a creative household and we had fantastic neighbors. We had originally conceived a sort of exquisite corpse of Cord’s work and mine and wanted to publish it in a book form. However, the storm put the wrench in those plans, so as we slowly returned to NOLA, I had him help me conceptualize the theme of ‘Replicas and Replacements’. After the storm, Constance was more necessary than ever for collecting and cataloging peoples’ work that never really had a chance for gallery space as well as up-and-coming, younger artists. Constance, at its core, wants to create a historical document of the times in which it is published. The aim of the publication is to let people outside the city know that there are still people working in the visual and literary arts. And then to share that work outside of a city that can be so insular about sharing its work.